Four years ago, I had enough of my cheap peelers and I threw them all out and bought a Kuhn Rikon Swiss peeler instead. 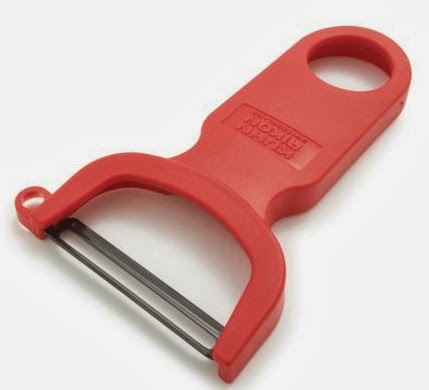 Peelers are something that you don't exactly think about too hard when replacing kitchenwares for Pesach, but like a good can opener, they are indispensable as basic kitchen tools. I probably will end up peeling about 25 lbs. of potatoes for Pesach, and I would rather be able to peel them quickly, efficiently and with as little of my own skin added to the peelings as possible. I have working in the kitchen professionally for over 20 years. This is one of the best peelers in the world. 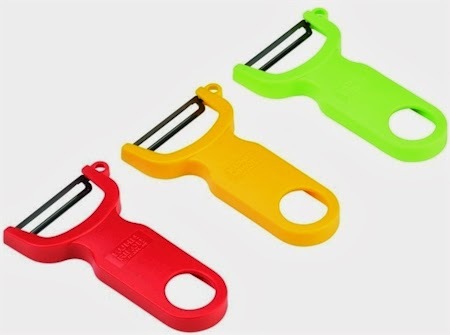 Like all other reviews this little peeler has the ability to handle tough items with ease, including hard gourds, but also is delicate enough to peel a tomato. The blade is extremely sharp and requires little maintenance. As far as the rusting of the blade PLEASE DO NOT put this peeler in the dishwasher. The carbon blade is reactive to acidity and requires a little food grade oil for storage. i have had one for ten years now and looks like new. If the blade does rust all you need is a SOS pad to remove and preventative maintenance in between. Never store wet and always wash after use in a mild soap solution dry completely after use and apply oil sparingly to the blade for storage. This peeler is well worth the price and is a great investment for the home cook and the professional. HIGHLY RECOMMENDED.